More and more I love doing hand work. There is something so peaceful and thoughtful about it. The first Intro to Hand Work class started on Saturday. I was eager to finish my homework, so I completed my sawtooth block by Sunday night. Since I didn’t need my machine, I did most of the work sitting in bed watching tv online and listening to podcasts. It feels so luxurious to sew this way! Over time, I’m sure my stitching may become more even, perhaps more tiny but I think I’m doing okay to start. 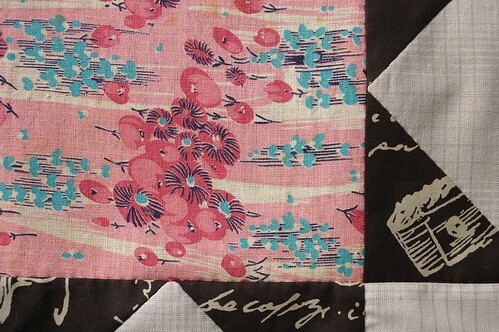 I decided to feature the pink vintage feedsack fabric that I bought at Quilt Market in October. The dark grey contrasting fabric is a Japanese import that we just received. 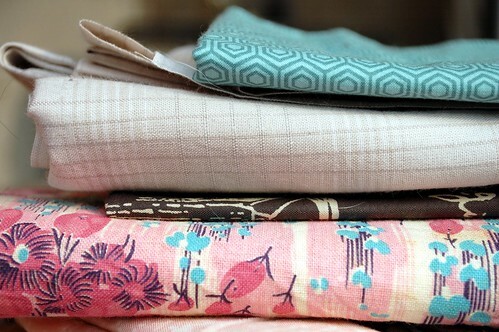 I’m hoping to throw in some aqua Tula Pink hexagons, but I don’t feel ready to commit to my border fabrics just yet. I bought a small vintage tin on ebay today to hold my hand quilting ‘kit’. I want everything to be kept together and portable, so I can work ‘on-the-go’. Our teacher, Carolanne, has two tins that sit one in the other on her lap while she rides the streetcar and does her hand piecing. BTW. My favourite pins right now are these slim white glass head pins. (last photo) They are nice to handle and easily slide through all fabrics, especially finer ones like Liberty Tana Lawns. It’s coming together so beautifully Karyn – I love the pink vintage feedsack fabric and admire your patience! that’s awesome! I recently saw the gees bend exhibit, which renewed my desire to hand piece/hand quilt. Probably a baby blanket. Good work. I love hand sewing, for all the same reasons you do. This looks great Karyn! I have recently started hand quilting myself and I am loving it! 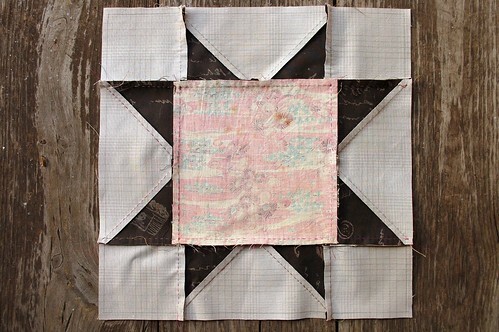 I’m not into hand piecing yet, but this post really makes me excited about that idea! I have kind of a silly question… How do you handle ironing when you are hand piecing? 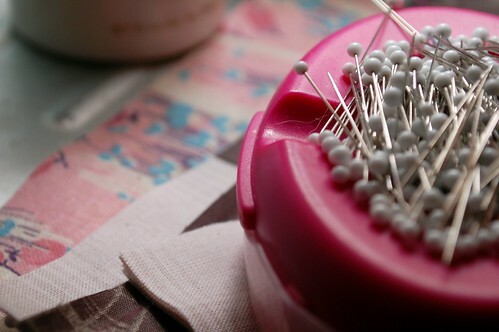 Do you sew at your leisure and run to the iron when you have the opportunity? I ask only because I know while machine sewing the iron seems to be so essential… I have a hard time imagine working without it! dude, i am inspired by carolanne’s tin, too! i was just thinking to myself that i need to check out what’s available on ebay. your block looks so good. i absolutely love the feedsack fabric. it’s gorgeous. isn’t it nice to not sit in front of your sewing machine sometimes? 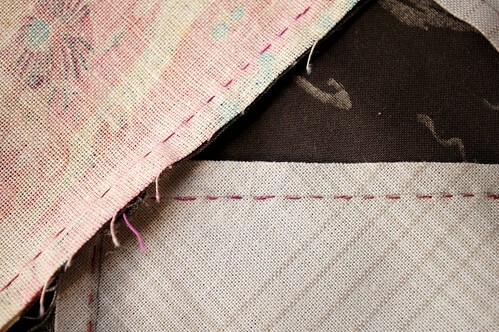 i love piecing while watching tv–it doesn’t feel like work, whereas machine sewing does. it looks so good! i love that pink feedsack fabric as well! This block looks so good! Very pretty fabric. 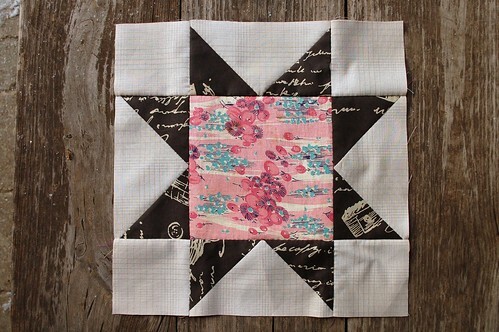 I’ve done hexagon blocks with English paper piecing, now I want to try this block too. Looks good. As a fellow hand sewer, beware of mixing vintage fabric with new. Many a project didn’t last long because the vintage fabric didn’t hold up as well as the new fabric. Personally, I think it adds to the charm, but sometimes, it just makes you sad. Lovely post! I agree, I find I’m much more relaxed doing hand sewing, it forces me to slow down and I’m usually pleased with the results. That pink fabric is completely ridiculously great. Very pretty and I’m impressed with your sharp matching corners! THis is giving me new ideas for how to get more sewing done. Hauling out my machine (I have to work at the dining table) really limits my available time for sewing. Please keep us posted as you discover the ins and outs. If I didnt’ live so far away, I would be taking this class! This is absolutely inspiring. Inspiring. I read your blog for a while now and you made me curious about hand piecing. I just started my first piece. Thanks for inspiring me.